NO MATTER WHERE YOU ARE IN LIFE, YOU CAN BE BETTER! Is this as good as it gets? Or can you enjoy more of what life has to offer? Not only can you live happily every day, bestselling author Joel Osteen suggests you must discover the potential within yourself and learn how to use it to live better, and to help others better themselves as well. God didn't create you to be average. You were created to excel! You have everything you need to fulfill your God-given destiny, and there is no limit to what you can accomplish if you discover how to be a better you! Become a Better You will guide you in the process of uncovering your hidden resources. Addressing such topics as building your confidence, developing better relationships, finding peace within, and staying passionate about life. Joel Osteen will encourage you to reach your unique God-given potential, and will help you to enjoy every day of your life, despite your circumstances. 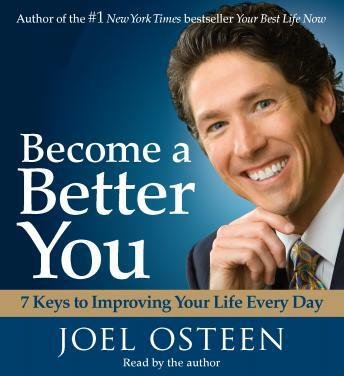 As you incorporate Joel's easy-to-grasp principles into your life, you will be pleasantly surprised at how much more God has in store for you, and how quickly you become a better you! The tips provide an wonderful perspective on living! An inspiration that we need today. Pastor Osteen gives excellent advise concerning GOD's will for our lives in simple, easy to understand terms and illustrations. I highly recommend this book to anyone who us struggling with what direction to take in life! !